Very aerial crystals that are spread out nicely across the matrix of Albite. 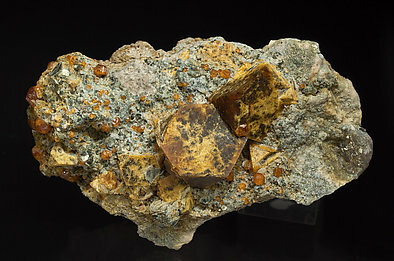 The fact that the latter is white gives a good contrast to the specimen and makes what is a rare, but often not that appealing, mineral into an esthetic specimen. Crystals have a tetrahedral habit, they are well defined and form groups esthetically aligned and contrasting on a white matrix of Albite. Very aerial sharp tetrahedral crystal of Helvine with an excellent luster for the species. 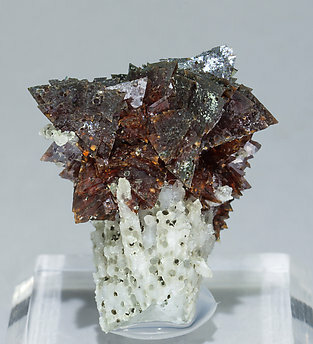 It is on matrix, with small crystals of Garnet. The crystal has been analyzed and we’ll send a copy of the analysis to the buyer. Rosette growth of very sharp tetrahedral Helvine crystals that have well defined faces and edges. 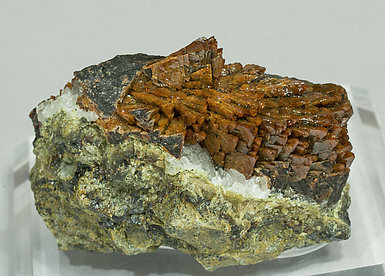 With the Helvine there are large Ilvaite crystals with polycrystalline surfaces and also very elongated Quartz crystals with parallel growths perpendicular to their main axis. All them are on matrix and partially coated by chlorite, which is also included in the Quartz. The sample is of an exceptional quality, among the best found at Huanggang. We’ll send a copy of the Helvine analysis to the buyer of the sample. 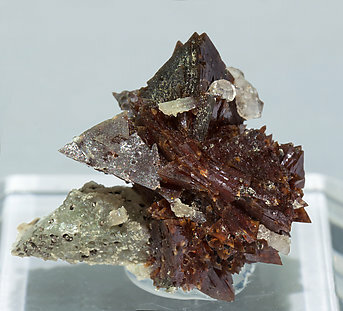 Group of very sharp tetrahedral Helvine crystals with very well defined faces and edges, a very intense luster, deep color and on matrix. 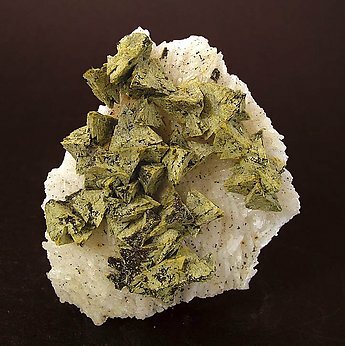 The crystals, carefully analyzed, note the absence of Genthelvite, so the crystals are only Helvine. We will send a copy of the analysis to the buyer. 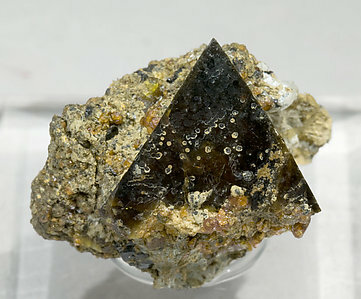 Very sharp tetrahedral crystals of Helvine whose color changes between yellow and black, suggesting the presence of more than a single species on each crystal. 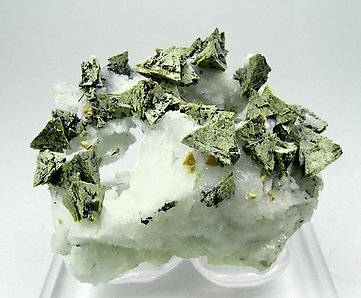 They are implanted on a matrix of Albite (Cleavelandite), with leafy aggregates and crystals of Muscovite. Group of very sharp tetrahedral crystals with very well defined faces and edges. 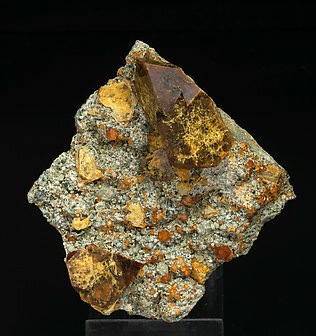 They are brown, with reddish reflections, and are locally coated by small crystals of Quartz. Analysis indicates that it is really Helvine, both externally and in the interior. We'll send both analytical results (external and internal) to the buyer. Group of very sharp tetrahedral crystals with very well defined faces and edges. 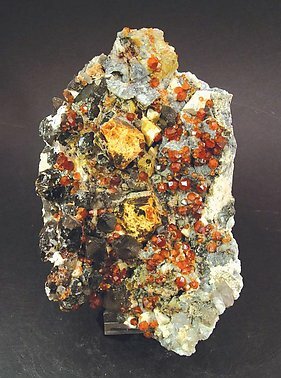 They are brown, with reddish reflections, and are with a group of Quartz crystals in parallel growths. Careful analyses indicate it is really Helvine, both externally and in the interior. We'll send both analytical results (external and internal) to the buyer. 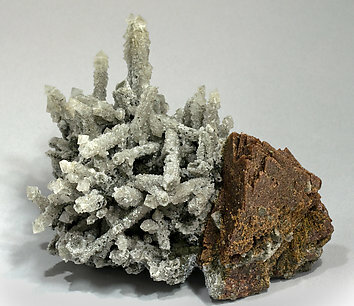 Aggregate of very sharp tetrahedral Helvine crystals with very well defined parallel growths and partially coated by Quartz crystals. The crystals have been Raman analyzed on their surface and in the interior, both analyses giving Helvine. We will send a copy of the analysis to the buyer. Due the size and perfection of the crystals it is a sample worthy being in a Museum. Very sharp and well defined crystals on Albite matrix. Next to the largest crystals there are some smaller ones, clean of impurities and of an intense, slightly orange, yellow color. 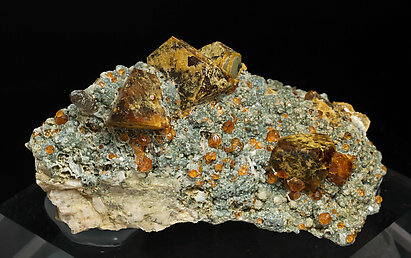 Very sharp Helvine crystals formed by the positive and negative rhombohedron, with the color between dark honey brown and yellow and implanted on a matrix coated by leafy aggregates of Chlorite and with orange trapezohedral Spessartine crystals. The species has been analyzed and we'll send a copy of the analysis to the buyer. 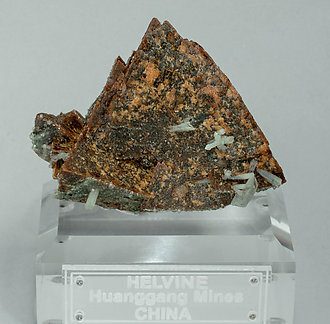 Helvine is not well known and is rarely found in this locality, which has become very famous for its Spessartine. 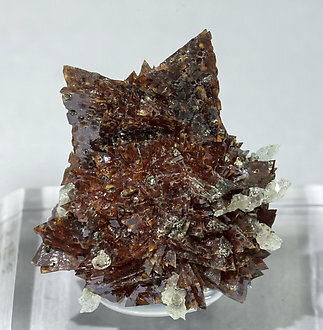 The crystals of Helvine in this specimen are really large, have octahedral faces, and well-defined edges. 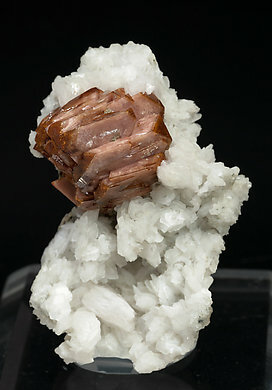 The smoky Quartz base supports the crystals of Spessartine and prisms of Feldspar, possibly Orthoclase. When combined with the Helvine this makes it one of the best for the species, and certainly for this locality. This specimen was photographed for the ‘what’s new at Munich 2004’ section of the magazine ‘Mineralien Welt’ and appears on page 7 of number 1/2005. We will send the purchaser a copy of the magazine. Group of very sharp crystals, with the faces of the positive and negative tetrahedrons very well defined, very bright, with a salmon color. They are zoned so the crystals are Helvine inside and Genthelvite on their edges. This group of crystals has been individually analyzed and we’ll send a copy of this analysis to the buyer. 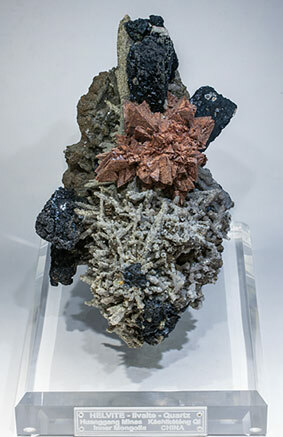 Group of very sharp tetrahedral crystals on matrix, with Calcite and Magnetite. They have very well defined faces and edges, and are very bright, with a salmon color. They are zoned so the crystals are Helvine inside and Genthelvite on their edges. The sample has been individually analyzed and we’ll send a copy of this analysis to the buyer. Aggregate of very sharp tetrahedral crystals with their faces and edges very well developed, very bright, with a salmon color. They are zoned so the crystals are Helvine inside and Genthelvite on their crust. The group, on matrix with Calcite, Quartz and chlorite coatings, has been individually analyzed and we’ll send a copy of this analysis to the buyer. 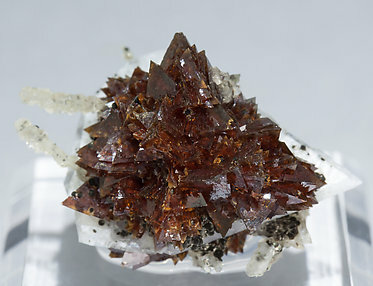 Aggregate of very sharp tetrahedral crystals, bright with dark a brown color and with small parallel Quartz aggregates. They are between transparent and translucent, as the picture under intense light shows, and this confers a special quality to the samples from this cavity. The sample has been analyzed showing dominant Helvine forming a solid solution with Genthelvite. We will send a copy of the analysis to the buyer. 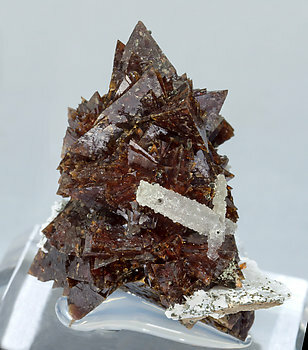 Aggregate of very sharp tetrahedral crystals, bright with a dark brown color and with small parallel Quartz aggregates. They are between transparent and translucent, as the picture under intense light shows, and this confers a special quality to the samples from this cavity. 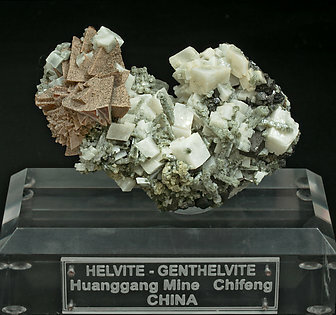 The sample has been analyzed showing dominant Helvine forming a solid solution with Genthelvite. We will send a copy of the analysis to the buyer. 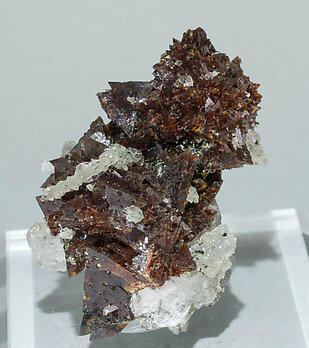 Aggregate of very sharp tetrahedral crystals, bright with a dark brown color and with small parallel Quartz aggregates and a very flattened Calcite crystal with its contour complete. They are between transparent and translucent, as the picture under intense light shows, and this confers a special quality to the samples from this cavity. 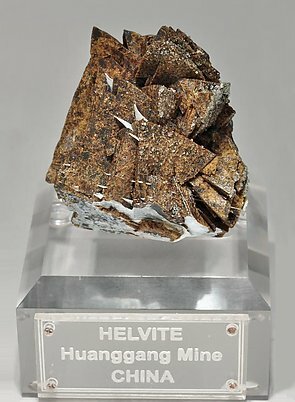 The sample has been analyzed showing dominant Helvine forming a solid solution with Genthelvite. We will send a copy of the analysis to the buyer. 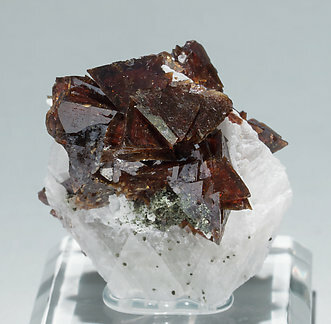 Aggregate of very sharp tetrahedral crystals, bright with a dark brown color and with small parallel Quartz aggregates and a strongly flattened Calcite crystal with its contour complete. They are between transparent and translucent, as the picture under intense light shows, and this confers a special quality to the samples from this cavity. The sample has been analyzed showing dominant Helvine forming a solid solution with Genthelvite. We will send a copy of the analysis to the buyer. 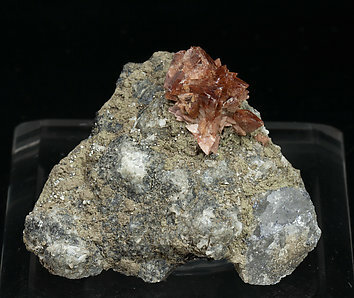 Aggregate of very sharp tetrahedral crystals, bright with a dark brown color and with small parallel Quartz aggregates and a strongly flattened Calcite crystal with its contour almost complete. They are between transparent and translucent, as the picture under intense light shows, and this confers a special quality to the samples from this cavity. 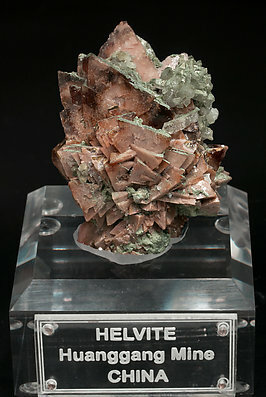 The sample has been analyzed showing dominant Helvine forming a solid solution with Genthelvite. We will send a copy of the analysis to the buyer. 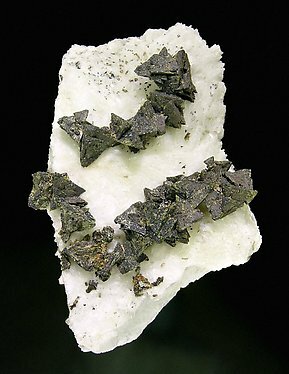 Group of very sharp tetrahedral Helvine crystals with a superficial layer of Genthelvite. 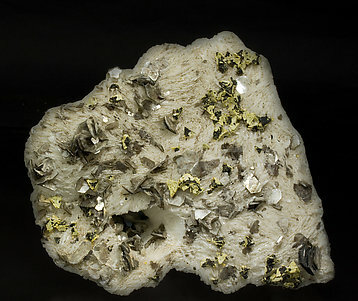 It is on matrix, with white Calcite rhombohedrons, dodecahedral Magnetite and parallel growths of Quartz. Very esthetic due to the contrast between the salmon Helvine-Genthelvite and the Calcite and Quartz matrix. We’ll send a copy of the Helvine-Genthelvite analysis to the buyer.